Sometime around December 5th, I became consumed with the idea that I would make handmade Christmas gifts for almost everyone I knew. I figured in the 20 days that were left before the big day, I could weave 7 scarves, tat half a dozen snowflakes, knit some hats, finish four quilts, make 3 baby gifts, and a tree skirt. You can probably guess how that turned out. The first scarf is still on the loom and only half finished. the other 6 still look like this. 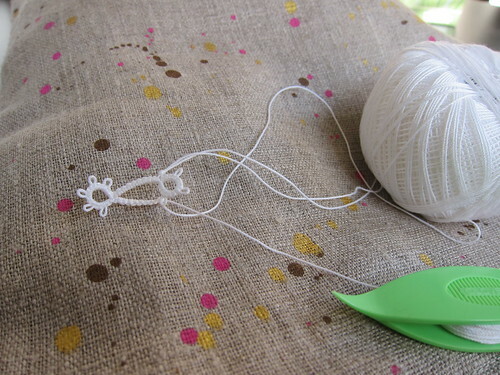 After a false start, the first tatted snowflake doesn't look much like a snowflake. That said, I did manage to finish the three hats and by finish I mean that they were still damp from blocking when I wrapped them up. A Jul hat for my sister-in-law (actually a much deeper shade of purple), a silk-lined New York Skyline hat for my brother-in-law (didn't get a finished shot of this one), and a Hurricane hat in Malabrigo for my mom. 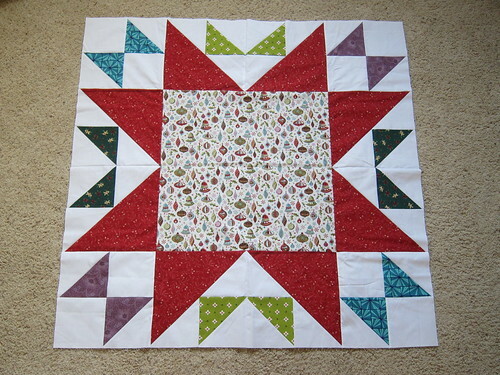 To my great relief, the Posy quilt re-do is finally finished and has been gifted to its itty-bitty recipient. Sorry for the crappy photo but it is identical to the first version except that this one washed and crinkled like a champ using Warm and White batting instead of turning itself into a floor mat like the last one. 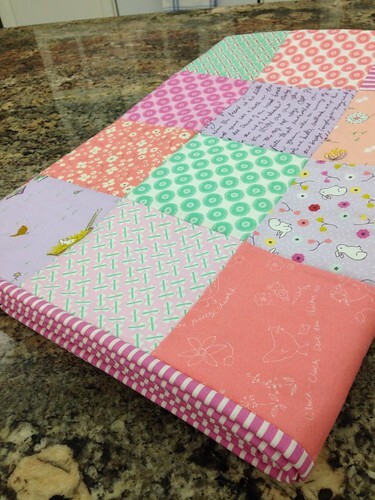 Sticking to my shop the stash mantra, I also pulled some fabric for another flannel voile baby blanket. 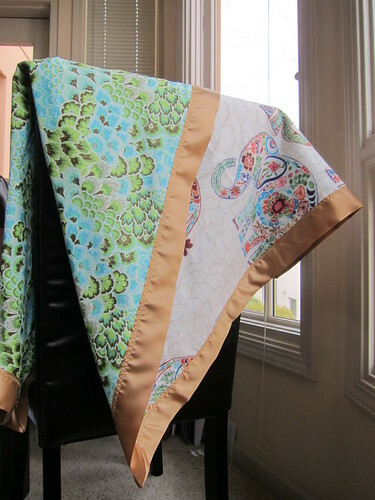 I used a yard of Valorie Wells flannel in Marrakech and a yard of Amy Butler voile in Peacock Feathers. The blanket satin binding is from Fabricland. I can say that having a walking foot to attach the blanket satin made a big difference. There are at least four more of these to come as I brace myself for the second round of friend babies scheduled to arrive later this year. I also finished the top half a tree skirt using the Tinsel Treeskirt pattern from Issue 11 of Fat Quarterly using only stash at about 3:00 a.m. two days before Christmas. Shortly thereafter, I realized there was no way that I was going to enjoy Christmas and get this finished so it's heading into the long-term planning box for next year. If you are going to attempt this one, be warned that the cutting instructions for the center panel are off by 1/2". I was too tired to notice until the pieces wouldn't fit together. Fortunately, my commitment to quilting perfection is pretty dull at 3:00 a.m. and I managed to fudge things enough to make it work. Partial success and a head-start for next year. I'll take it! I'm impressed at all of your projects! I really like all three of your hats! I only attempted one handmade Christmas gift and it did not get done. :) I also have a ton of friends expecting babies this year. Lots of baby quilts in our futures!!! Anyway, I'm so glad you managed to make another one, and I love all your gorgeous hats. 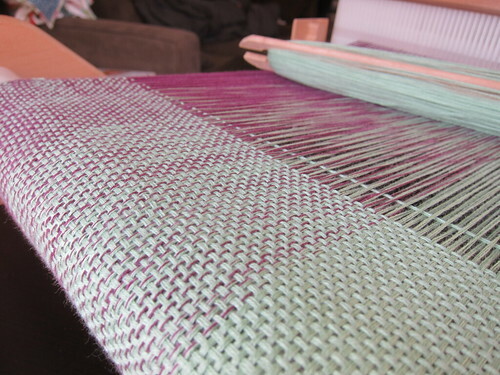 :D Also I am really fascinated by this weaving thing! 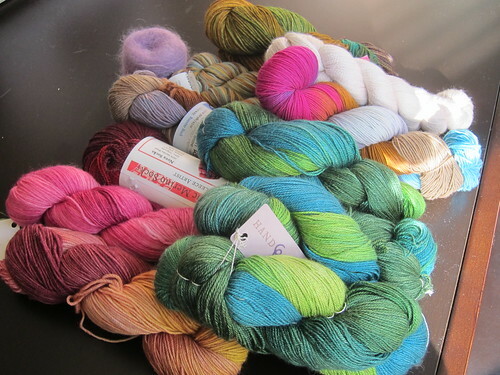 Your pile of yarn is so pretty!! I love that you are keeping it real! I look forward to seeing your finished scarf/scarves - it looks so pretty on the loom. you are too funny!! thanks for keeping it real! sound just like my sewing adventures!! All part of learning!! Tree skirt is adorable. Keep meaning to subscribe to the emag, but then never quite get there.